Page Mandarins have flesh that is deep orange, tender and juicy, with a flavor that is rich and sweet. It is known as one of the best mandarins for juicing. 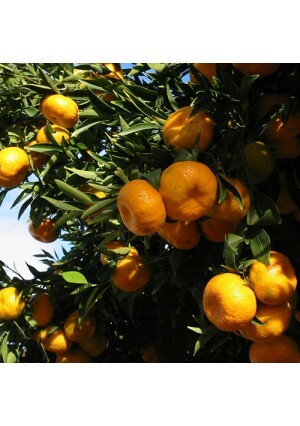 The fruits are medium sized with a medium-thin, leathery rind that is moderately adherent but easily peelable. Page Mandarins have a color that is reddish-orange at maturity. The fruits contain seeds.This early ripening, high-quality variety ripens in the winter. Page Mandarins, with glossy foliage and colorful fruit, are an excellent indoor plant that enhances any home's decor. Page Mandarins are cold hardy in USDA Growing Zones 9-11. They can be kept as container-grown plants in all other growing zones if they are brought inside for the winter. Page Mandarin Trees are an early ripening fruit variety that makes a lovely indoor plant.